It's an image so iconic that people all over the world re-enact it more than seven decades later. That's what dozens were doing at Waterfront Park in downtown San Diego Monday, next to the 25-foot statue commonly called "Kissing Sailor." But what many might not know is the statue is based on George Mendonsa, a U.S. Navy Sailor, who died Sunday at the age of 95. "I wonder what he thought about becoming so famous, even though you didn't know his name," wondered Diane Schneider while looking at the statue Monday afternoon. Mendonsa planted a kiss on Friedman, whom he had never met. The picture became one of the most famous of the 20th century. On Valentine's Day in 2013, the statue was permanently placed in San Diego. "It's a part of history," said Mason Athan, who was attempting to replicate the pose with his wife for a picture. "We thought we'd take our own photo and make a little bit of history ourselves." 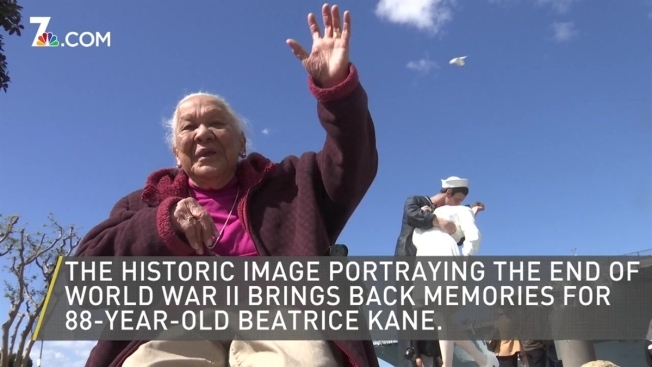 The historic image portraying the end of World War II brings back memories for Beatrice Kane, 88, who lived in O'ahu at the start of the war. "When they first bombed Hawaii, everybody went Berserk," said Kane in downtown San Diego on Monday. Kane said her mother worked at Pearl Harbor with sailors when it was bombed in 1941, an event that thrust the United States into the war. "I was in church and they said 'it's war,' and I said, 'war?!'" Kane recalled. She was around 11-years-old at the time.